Barack Ferrazzano Financial Institutions Group's John Geiringer will be a guest speaker during the Enterprise Governance, Risk and Compliance (EGRC) Summit in San Diego on January 26-28, 2015. John's presentation, "The 2015 Regulatory Road Map: Laws, Regulations and Regulatory Guidance Kicking off in 2015 - Pitfalls to Avoid, Impact to the Business and What to Plan for Now," examines the latest rules and regulations that will impact banking in 2015 and the years to come and will provide guidance on risk and compliance management. What examiners are finding and what they will focus on in 2015. Christopher Dodd and Barney Frank will present insights on upcoming provisions of the Wall Street Reform and Consumer Protection Act. Break-out sessions will focus on: Risk, compliance and audit, and topics for board members and executives. For more information on the 2015 ERGC Summit and how to register, click here. Barack Ferrazzano's John M. Geiringer (center) recently spoke at the annual FIS Enterprise Governance, Risk and Compliance Conference about current regulatory issues facing banks, such as M&A challenges, BSA/AML, UDAAP, and cybersecurity. 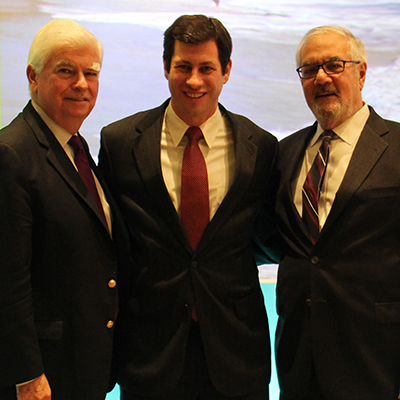 Here’s John with two of his fellow speakers Christopher Dodd (left) and Barney Frank (right).